HERMANN-Spielwaren, Coburg, Germany exclusive, limited edition collectible Teddy Bear. Limited Edition of only 50 pieces, wearing a gold-plated heart at his collar. He has an embroidered red heart on his pawpad, together with his name "Teddy In Love", and his edition number out of the edition of 50 pieces. HERMANN-Spielwaren, Coburg, Bear, with a press- voice, hand-made of rich high-grade red plush with a white muzzle and pawpads, a white collar, and filled with cuddly, soft polyester. He is fully 5 times jointed: his arms. legs and the head are all moveable, with an embroidered pawpad. Hermann-Spielwaren is one of the oldest still existing Teddy Bear companies in the world, founded in 1920 in Neufang near Sonneberg. The company is world-famous for their craftmanship, extraordinary designs, exclusive small editions and that every bear, hand-made in Coburg, Germany has its own personality. 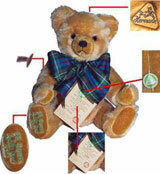 Each bear is made by highly skilled craftsmen and women and they have won many prestigious Awards. Size: 32 cm, 12.75 inches tall. Hermann-Spielwaren bear with triangular HERMANN neckmark in the back of the head and with the green HERMANN hangtag, "The bear with the running dog".